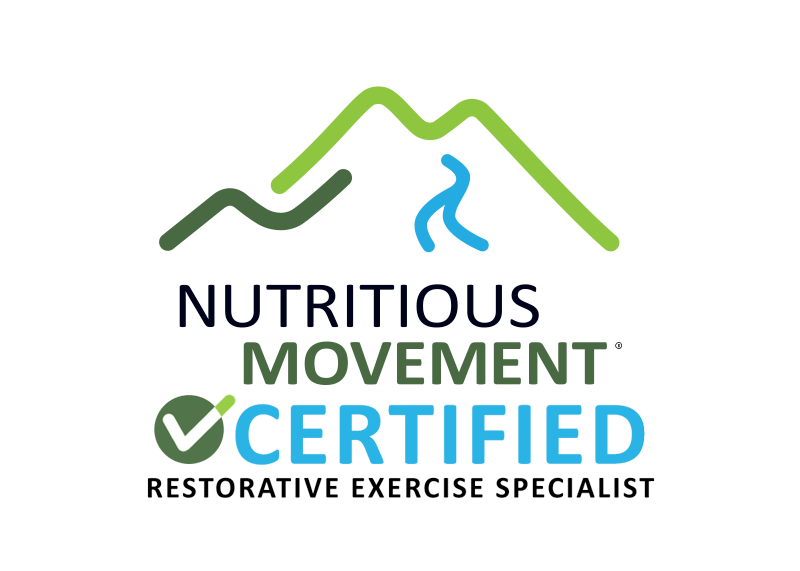 I am a Nutritious Movement ™ certified Restorative Exercise Specialist. I can teach you how to fill in your weak spots with corrective exercises so you will have a stronger and more functional body. Private sessions begin with time spent explaining alignment points. Our bodies, much like our cars function best when all our parts are in the proper place and have their full range of motion. We start at the feet, our foundation and work up the body. The session will continue with corrective exercises that will address your pressing issues. Corrective exercise will help to strengthen and increase flexibility to all parts your body. When you add more movement and more kinds of movement into your life your body can functional at its optimal level. In the follow up sessions we can move right to the correctives that will help you best at that time. If you have any questions about the alignment points we can review them as well. Semi - Privates also available so you can invite a friend or family member to improve their health as well . My clients who have enjoyed a private RE session right before their regularly scheduled massage have found much benefit in this. It can be done weekly, every two weeks or even monthly. They say the massage feels even better after a restorative exercise session. Just think who doesn’t want a massage after a good work out! Heather teaches group restorative exercise classes regularly around the Denver / Wheat Ridge area. Group classes are a perfect way to add more movement into your life. When you attend classes on a regular basis will keep your body feeling great and learn all the corrective exercises. Heather teaches an 8 week Whole Body Health Series that is a great way to make a commitment to your health. Each class will be fun and unique and specialize on benefiting different areas of the body. She also teaches Strong Healthy Foot classes and Prenatal Restorative Exercise Series. For up to date happenings check the Classes and Workshop page . Check the Abundant Balance Facebook and Instagram pages for current events.